This morning Malcolm told us about a dream that started slightly scary and strange, but turned into a fun adventure. Isaac wanted to be in Malcolm’s dream, and he kept asking where he was during all of the action. Finally Malcolm said, “You were in your own dream!” And Malcolm was undoubtedly in Isaac’s dream, and before long Isaac would have scampered into Malcolm’s, if he hadn’t woken up. In my own dream, instead of tears, small bubbles came out of my eyes. They were sort of smoky amber colored, and about the size of marbles. They rose from my eyes into the air. In my dream I wrote a poem about the golden bubbles, and in my dream I loved the poem, it seemed perfect to me, and I was sure I would remember it when I woke up. I didn’t, of course, but I did feel vaguely hopeful, and happy to think about crying glowing bubbles rather than tears. It made me think about the story of Pandora, which I had read earlier in the day. When she opened the box, all of the evils flew out: drudgery, old age, gossip, distrust, envy, lies, deceit, accusation and despair. But she managed to close the box in time to keep hope inside. “Zeus had put hope at the bottom of the jar, and the unleashed miseries would quickly have put an end to it.” But they didn’t, so we mortals still have hope, which means we still have a chance to live and be happy. I’m calling this “salsamole” because it seems like a combination of guacamole and salsa. 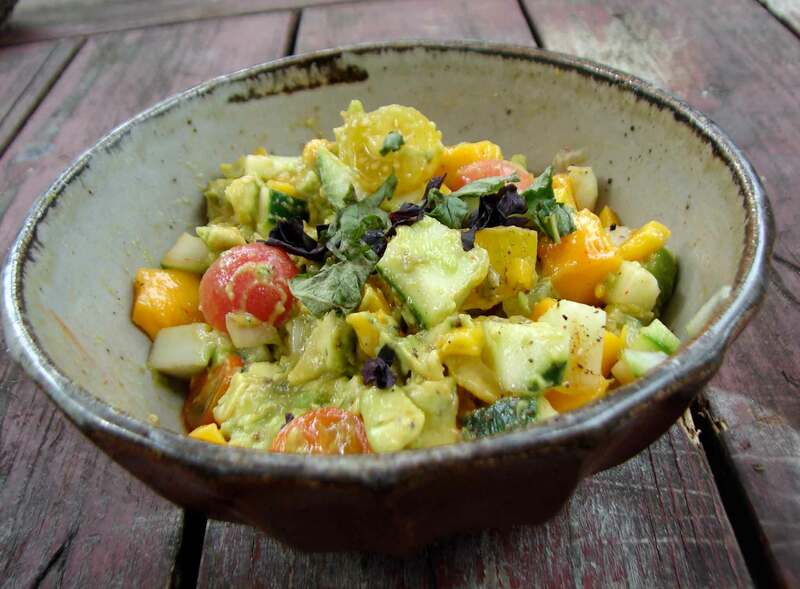 I had a lovely ripe champagne mango, and a lovely ripe avocado, and I decided to combine them. I added cucumber for crispy crunch and some little yellow, orange, and red cherry and grape tomatoes from the farm. I kept it simple and bright, but you could easily add chives or roasted garlic or herbs, if you wanted to make it more complicated. This was very fresh and delicious, and didn’t last very long! Here’s the Velvet Underground with Beginning to See the Light. I met myself in a dream, and let me tell you, everything was alright. Combine all of the fruit and veggies and lightly toss. Squeeze over the lemon and add the hot sauce. Season, and eat! You can adjust amounts according to your taste. 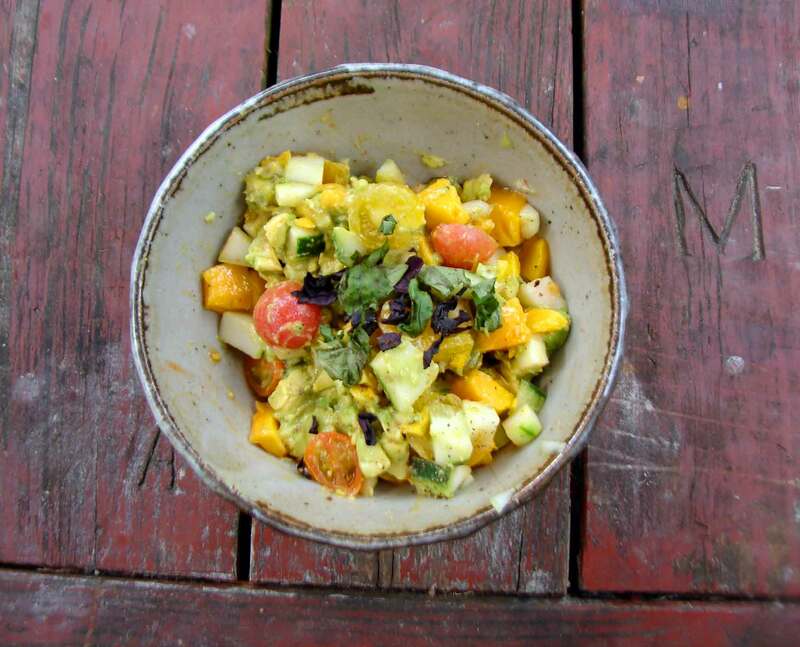 This entry was posted in appetizer, recipe and tagged mango guacamole, mango salsa by Claire. Bookmark the permalink.